The immediacy of impact to be found in Walton’s music—its directness of utterance, clear melodic and emotional appeal, as well as dramatic character—was fully exhibited in the concertos, Belshazzar’s Feast and the symphony, and soon led to him being invited to write film music; sound had first become part of film only in the late 1920s. Walton at once showed his mettle in ‘Escape me never’ (1934), and eventually wrote fourteen film scores, proving himself to be a master of the genre. The success of the 1942 film ‘The first of the few’—dramatizing the race to design and construct the Supermarine Spitfire fighter aircraft prior to the outbreak of war and the RAF’s success during the 1940/1 Blitz—was due in no small part to Walton’s music, and this encouraged him to fashion from his score a patriotic concert piece, in much the same characteristic vein as his 1937 coronation march Crown Imperial. The Spitfire Prelude and Fugue was premiered in Liverpool in January 1943, in an all-Walton concert he conducted. The significance of the premiere was not lost on those who, forty-odd years before, had witnessed the first performances of Elgar’s first two Pomp and Circumstance marches in the same hall. The prelude emanates from the film’s title music, the fugue accompanying the construction of the prototype Spitfire and evoking, as Mark Doran writes, ‘the “one part added to another part, added to another part …” aspect of an aircraft’s assembly … [as well as] depicting the single-minded pursuit of a complex task’. 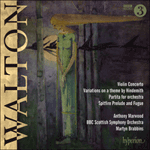 As with Crown Imperial, the Spitfire Prelude and Fugue exhibits Walton’s ‘popular’ touch. The piece, with connotations of wartime victory, was championed in America by Stokowski, who conducted three performances in New York.